Ahaziah, the King of Judah, was a wicked King because he was advised by his mother Athaliah, who was the daughter of Ahab and Jezebel (2 Kings 10). He accompanied his uncle Jehoram, king of Israel, in a war against Hazael, the king of the Arameans. 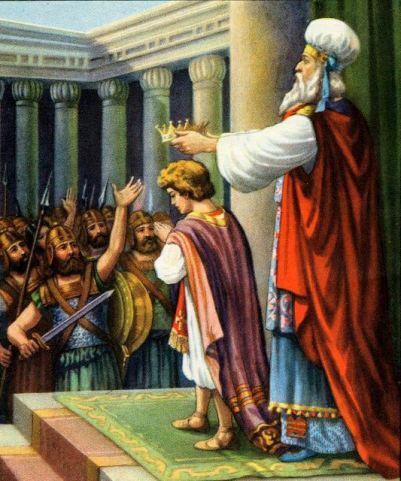 Ahaziah got caught up in a revolt of Jehu, one of his cousins, who wanted to be king of Israel. Ahaziah was wounded when he and Jehoram went out to greet Jehu. Ahaziah fled for his life, but was wounded and later died (2 Kings 10). When Athaliah, Ahaziah's mother, learned that he had been killed she murdered all of the remaining royal seed (her grandchildren) and claimed the throne of Judah for herself (2 Kings 11:1). (To read more of Athaliah's story go here). Joash was a righteous King and under Jehoiada's supervision he tore down all idol worship in the country and attempted to repair the temple which had been damaged by his father and uncles (2 Chr. 23:17-20). Yet after Jehoiada died Joash was flattered by the princes of Judah and began to forget the Lord. He built groves and altars for idol worship and rejected and stoned the prophets of the Lord. He was eventually assassinated by some of his close associates (2 Chronicles 24:17-27). We know that Joash's mother's name was Zibiah of Beersheba but we don't know anything else about her (2 Kings 12:1). Joash was very young when Jehosheba rescued him (under 1 years-old) and since it is mentioned that "his nurse" was hidden along with him it indicates that his mother may have been dead. Zibiah would have been Jehosheba's sister-in-law and it makes me wonder what sort of relationship these two women had. Part of me really loves to imagine that they might have been good friends and that by rescuing Joash and raising him as her own Jehosheba was honoring the memory of a beloved sister-in-law. 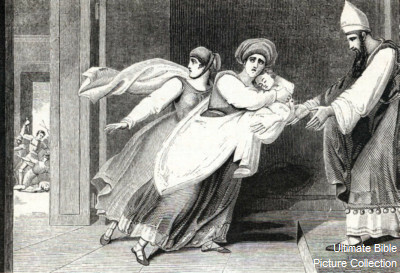 Or it may have been that Zibiah was as wicked as her husband and mother-in-law and Jehosheba was grateful for a chance to raise the child without her influence. Still, no matter what the situation was it is still neat that we have Zibiah's name! In 2 Chronicles 24:16 it mentions that when Jehoiada died the people buried him "in the city of David among the kings". This is a remarkable honor for a man who was only the high priest in the temple and not the king. It gives us insight into what sort of couple he and Jehosheaba must have been and how respected they were by the people. Since wives were often buried next to their husbands it is possible that Jehosheba may also have been buried in a place of honor. After Jehoiada's death Joash started giving more attention to the flattery of the princes of Judah and began to turn from the ways of the Lord. He even went so far as to allow the people to stone and kill Zechariah, who was Jehoiada's son, when he preached repentance (2 Chronicles 24:20-22). It is possible that Zechariah was also the son of Jehosheba and it makes one wonder how she must have felt (if she was still living) to see the man she had raised as her own kill one of her sons and make such bad choices. Jehosheba is one of my all time favorite women in the scriptures. There are two reasons I love her. The first is that her actions made it possible for the Savior to be born through the line of Judah. Joash was the last living heir of the Davidic line and if he had died then David's (and Judah's) lineage would have died with him. She showed great bravery, compassion, and faith and deserves to be honored along side other great women-- like Ruth and Tamar--who also made hard choices in order to preserve the Savior's lineage. The other reason I love her is that despite having a horrible grandmother (Jezebel) and an even more horrible mother (Athaliah) she herself was a righteous woman of God. Instead of getting tangled up in the goddess and idol worship her mother and grandmother practiced she tied herself to the temple (it helps if you marry the priest) and to the True and Living God. Her life was much different than that of her grandmother and her mother because she was able to recognize truth and embraced it with her whole soul. Her story is a powerful testament to the fact that we don't have to allow the choices our families made shape the type of person we become. We each have the ability to choose and by staying close to the Lord we can construct a different sort of life and future for ourselves and our posterity than the one we grew up in. Each woman holds the fate of generations in her hands. All it takes is one woman who choose to make a good choice and follow the Lord and it can change the future for generations upon generations. Unfortunately the opposite is also true, that it only takes one woman who chooses to turn away from the gospel and from the Lord for generations to wander in darkness until another "Jehosheba" emerges and chooses to embrace the light again. It is so important that we remember we are tied to future generations and that the choices we make, for good or bad, will impact their lives! How do you think she managed to keep Joash hidden for seven years? What sort of challenges would she have faced? Why do you think she did it? How do you think Jehosheba's influence helped shape the type of King and leader that Joash became? Do you know any women that remind you of Jehosheba? Women who grew up in homes that were not conducive to the spirit of God but who were still able to embrace truth and break free of unrighteous traditions? How have their choices influenced their children and grandchildren? My own Grandmother was like Jehosheba. She came from a family full of terrible darkness and wickedness, yet she chose to walk in the light. She wasn't perfect, but she was amazing. I don't know how she managed to turn to the Lord considering what she went though. I'm so grateful she made the choices she did because that means I was born into a family who loved the gospel, as were nearly 50 other grandchildren. I'm so glad I found your site. What a treasure! I just love your explanation as I named my little one Jehoshabeth . All what you thought I had it when we named her. I always wondered why people miss this great lady in Bible. After 7 years, i am finding your page. Thanks you You made my day.